VentureFin is an equity and loan crowd-investing platform bridging the gap between investors and businesses. VentureFin offers investors the opportunity to invest in three categories; Startups, Existing Companies, and Projects. What makes VentureFin unique is its strategic partnership with the world’s largest social business accelerator, the Hult Prize which delivers a unique pipeline of high-impact business proposals from around the globe. 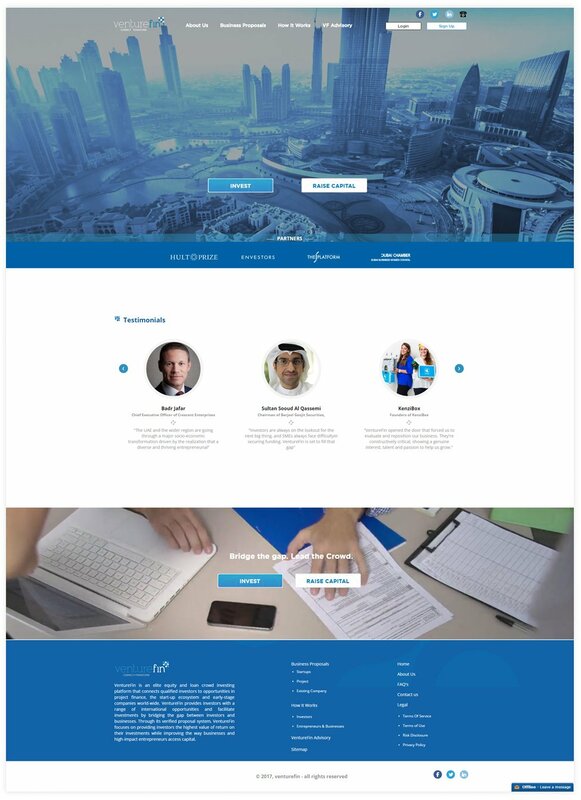 The design of the VentureFin website is predominantly blue keeping in view its industry. 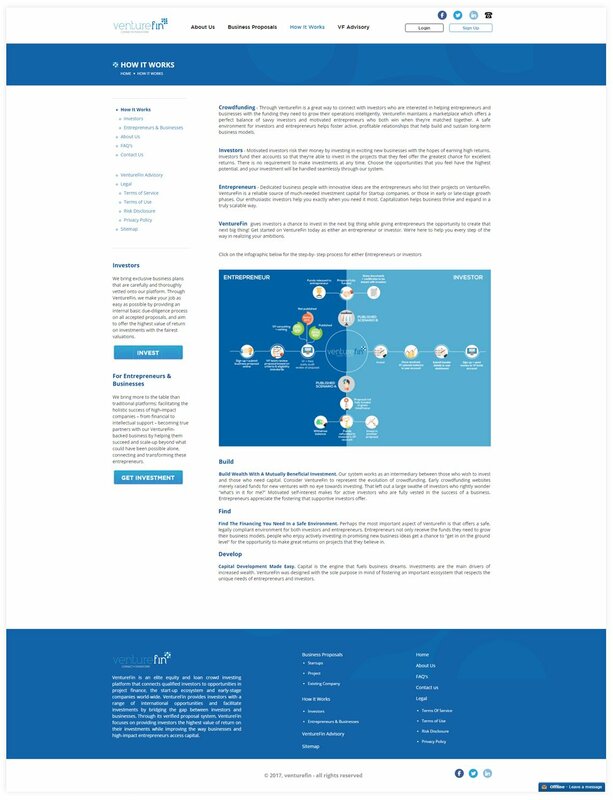 The website is uniquely designed and its immediately evident as to what VentureFin is about and what each menu item is. Above the fold on the homepage there is a wide-view video background in blue tone with two prominent call-to-action buttons - one for "INVEST" and the other for "RAISE CAPITAL". 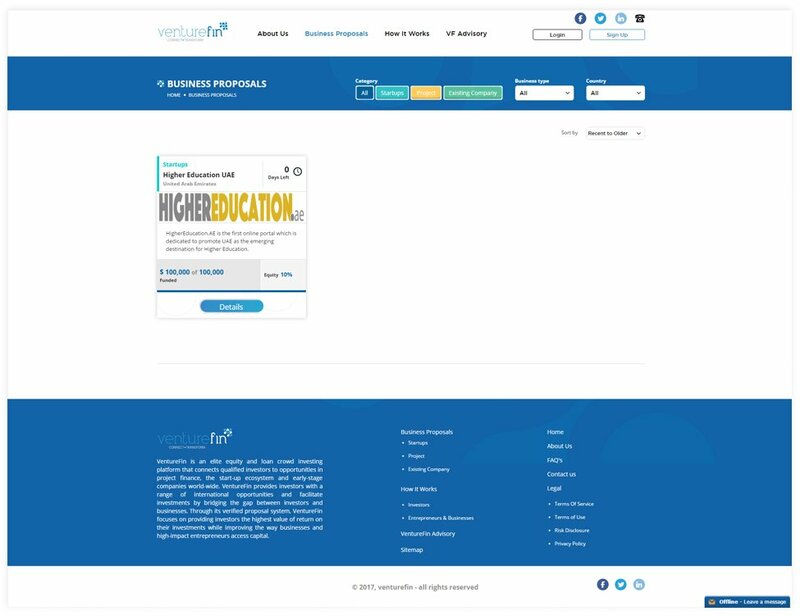 The top menu allows the user to go into the About Us section, view Business Proposals, Learn about how it works and enter into the VF Advisory section. Further down the homepage there are quick links to featured business proposals and testimonials. The Business Proposals section is quite detailed as it provides entrepreneurs the ability to add videos, write detailed descriptions about their business and the team, add an FAQs section and provide quick summaries about their business and the level of funding they are looking for.